One of Europe’s largest deer farms lies hidden in the hills of southern Hungary and is home to more than 1,500 strong red deer. The animals are essentially still wild. They were first caught in the forest and brought to the farm only 25 years ago – and the handling of them is still a physical conflict between man and animal. 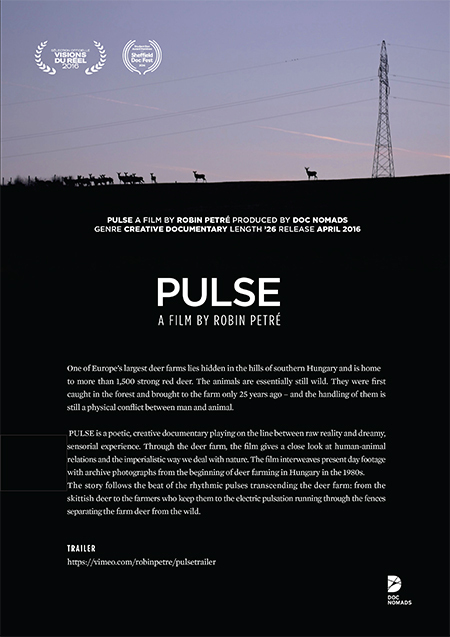 PULSE is a poetic, creative documentary playing on the line between raw reality and dreamy, sensorial experience. Through the deer farm, the film gives a close look at human-animal relations and the imperialistic way we deal with nature. The film interweaves present day footage with archive photographs from the beginning of deer farming in Hungary in the 1980s. The story follows the beat of the rhythmic pulses transcending the deer farm: from the skittish deer to the farmers who keep them to the electric pulsation running through the fences separating the farm deer from the wild.